Today’s women have more power than they ever have before. Women are using their purpose and passions to positively impact their personal lives and their workplaces. To maintain this level of power, women need community. More importantly, they need a resource that connects them to that community, so they can grow, learn, and reach the potential they desire in life and career. And that’s why I created the WWITOS™ Inner Circle. 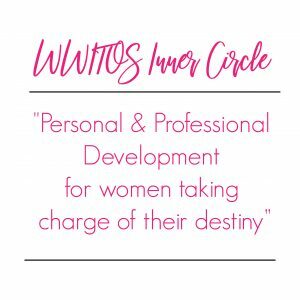 The information, resources, and programs provided within the WWITOS™ Inner Circle membership is for para-professional, professional, startup business owners, and employed entrepreneurs. The women who are a part of this community understand that personal and professional development is the key to achieving BIG! I created the WWITOS™ Inner Circle with you in mind. A woman who is on the move with her life visions, goals, and ready for personal and professional success. It’s time for you to join other women who are discovering empowerment and inspiration in all areas of their lives through the WWITOS™ Inner Circle community. What’s Included as a Member of the WWITOS™ Inner Circle? Connect with other like-minded women. In a time where women need to be supported more than ever, it’s by having a connection to this type of community that you can learn to stretch yourself and grow to your fullest potential. The Inner Circle community also connects you with other coaches and free resources in addition to providing you with the ability to discover events and services that can support you with your personal, professional, and/or entrepreneurial aspirations. How Much Does Membership for the WWITOS Inner Circle Cost? The WWITOS Inner Circle costs $ per month. For less than what you probably spend on lunch in a week, you can have direct access to a community that has something for every woman. If you’re ready to invest in yourself, maximize your full potential, and be a Woman Walking in Her Own Shoes™, then I encourage you to click the link below to apply now!